Religion and Conflict: The Archbishop of Canterbury’s Crusade Against Neoliberalism…. The Archbishop of Canterbury, Justin Welby, seems to be firmly against corporate greed and Tory neoliberal policies which allow Corporations the freedom to exploit workers. His explicitly political stance against mainstream political and economic institutions seems to be a good example of a religious leader getting involved in political conflict. 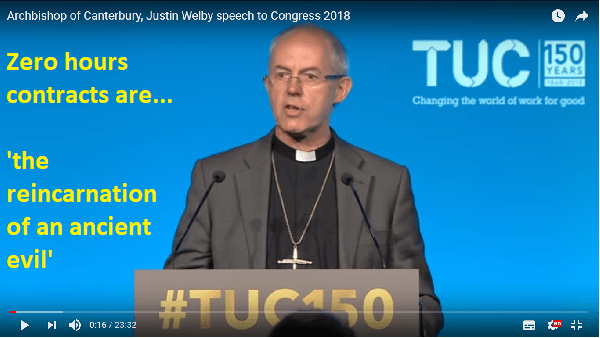 At the Trade’s Union conference Just last week Welby described zero hours contracts as ‘the reincarnation of an ancient evil’ and accused Amazon of avoiding tax and ‘leaching’ off the public. The Archbishop seems to be firmly in the ‘Jeremy Corbyn camp’: he has been speaking out against Tory austerity policies since he took up office in 2013. He has consistently criticized modern capitalism and tory welfare cuts; and has previously stated that he wanted to see the payday loan company Wonga put out of business (so at least he’s got something to be happy about!). Welby probably has a lot of direct experience to draw on: all over the country Church of England churches have been setting up food banks and acting as night shelters for the homeless, effectively playing a role in filling the Tory’s welfare gap. This seems to be a great example of a major religious leader standing up for the poor, in the tradition of Liberation Theology. Potentially this is religion acting as a source of conflict… here Welby is railing explicitly against mainstream political and economic institutions. This is most definitely NOT an example of religion acting as a conservative force: this is a religious leader demanding radical change. There is possibly an element of hypocrisy to Welby’s views: The Church of England itself has shares in Amazon, and even uses zero hours contracts. This further suggests that Welby’s views might be out of step with the rest of the Church of England. Maybe the views of this one individual are genuine, but maybe he actually has any real power to really bring about any kind of far reaching, radical social change?